This picture shows a close-up view of this brick built colossus. It was, I believe, one of the largest brick structures in the country when it was first built. The photos are of Shoreham B Power station. Shoreham A was a bit further to the East and was closed in the late 1970s I think. As a school child I went on a trip to Shoreham B. It was very interesting. They burned around 20% domestic rubbish even in those far-off days. The two boats which brought the coal to the power station were the last coal steam boats of their kind in the UK. I think one was saved and is a floating restuarant, or perhpas that was just wishful thinking. They each had a lovely red rounded funnel and the special crane which dug out the coal was great to watch. The offical name for the first two power stations were Brighton A and Brighton B, both at Southwick. It is only the third most recent power station that has been officially called Shoreham Power Station but you will not find it within Shoreham’s boundaries. It is firmly built in Southwick. It is built in Portslade and the stack is 107metres high – same as the old ones. The last steam colliers at Brighton B power station, were the ‘Sir William Walker’, the ‘James Rowan’ and the ‘Cliff Quay’. The ‘Sir William Walker’ was sold for scrap and towed out of Shoreham for the last time in 1984 or 1985 (I can’t remember exactly), and both the ‘Rowan’ and the ‘Cliff Quay’ were due to be the focus of heritage projects of some kind; I have no idea whether any of them came to fruition. I worked at Southern Port Services, who were the agents for the power station colliers, from 1982 to 1985. There is something seriously wrong with the upper photograph. The wharf shown on the right was Corrals ‘Turberville Wharf’ situated on the Brighton Rd. As we are looking from West to East it should be on the LEFT side of the photo. Anyone got any ideas ??? Ian, you’re absolutely right about the top photo; it’s a “mirror” image! I’d say it must have been taken from the beach at Southwick, just east of the lighthouse, looking east. As you say, Turberville Wharf should be on the left, and the Outer Layby on the right, but they’ve been swapped! Most odd – had me fooled! They certainly knew how to build power stations in the days of Brighton A. I love the sadly now very rare brick cathedral type of power station. I think there are only three surviving examples in the UK from that era now: Battersea, Bankside and Uskmouth. Splendid pictures of an elegant structure (though the top one still needs to be flipped over). They certainly don’t build them like that any more – even the bricks were specially chosen to blend with the shingle. Where you couldn’t normally see them they were red. I went on a guided tour around Brighton B as a kid in about 1976 and found it all very impressive – the huge boilers, the pulverised fuel plant that made the building shake, the roar of the turbines – and the classic 1950s parquet floored control room. At that time the A station (chimneys just visible in top photo) was still in use in peak load periods. Believe 1977 was its last year in service. I still remember its black corrugated steel cladding and that slightly sinister looking cooling pond next to the road. Always enjoyed going to the beach at Shoreham with the parents and driving along that road under the gantry cranes and under the ash chutes of the B station. It lasted until 1987 and by the following spring the east chimney had already been blown up. Physically, the station probably still had years of life left in it but the distance from its fuel supply probably did for it. What a shame to see it reduced to rubble! My grandad was a foreman during the construction of the power station in the 1950’s. He told me that he was involved in a tragic accident at the site. A section of scaffolding came down whilst he was there killing the two men working either side of him, and trapping him within it (it was box shaped, rather like the arm of a crane). He escaped largely uninjured, but was literally inches from death. Could someone please enlighten me? As a kid in the early 60s I remember dad taking us for a drive along the wharf passing a very, very old power house and then showing us the new power station that if I recall correctly had two very tall stacks. Shortly after that we left the UK for Oz, what happened to the new(then) power station? I worked in this great power station. I was born and lived my first six or seven years in Southwick, and first attended the Green School for infants. I remember we built a model of the power station and docks in about 1957. It was an industrial stretch of foreshore far removed from the seaside of Brighton. When did the Shoreham chimney or power station get blown up? The Eastern chimney and the main power station building was demolished in 1988. The Western chimney was demolished in 1998 to make way for the current power station. My uncle worked there for many years, and he became third from the top job, but then the station closed and he retired. His name was Allan Killick, someone may remember him, unfortunately he passed away on Boxing day 2008. 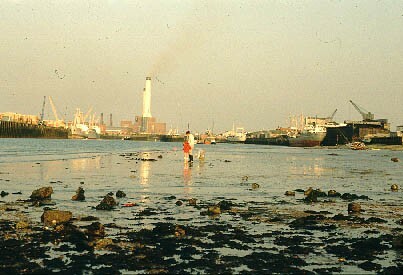 I worked at Brighton B power station Shoreham and have many fond memories. I was housed in a hostel with 70 other apprentices in Southwick which was owned by the CEGB. Every morning we would cross the green at Southwick and across the lock gates through the B site to the apprentice training school which was behind the insulator test rig. I was one of the lucky few to get a look around the old A site after it had been shut down for many years. One of the tasks the instructor had set up was to remove an old anvil form the A site mechanical work shop. I can remember opening the workshop door and seeing 3-4 inches of coal and ash dust throughout the workshop. It was just like stepping back in time with the heavy machinery still in place, a main drive shaft above the machinery shop fed from a large motor in the corner. All lathes, milling and drilling machinery were fed by large leather drive belts. A health and safety nightmare these days. Bert Pulling was a painter at the power station and he asked a chap if the electric turbine was switched off and he said it was, but it was not, and when he touched it, it threw him across the room and his hair stood up on end for three weeks. In 1954/5 I attended the first year of the CEGB Apprentice Training School in Brighton B, The Trainer, Benjamin (Benjy) Baldwin, was a magnificent person. There was only nine of us and we set the workshop up, unpacking the lathes etc. and positioning them. We stayed in a Hotel in Portslade, it was a year or so later that the CEGB purchased Max Millers place and converted it to the Hostel. The second part of the Power Station was under construction and that winter there were a few accidents on site, there was also a big reblading program for the first three turbines. I have some photographs of the training school which was in an annex on the SE corner of the Station. A Station was running in the winter and was very dusty. My dad Paul Fallows also worked here for many years until his death and was there when they blew up the old A station chimney. I have many memories of the ‘works’ Christmas kids parties. Can anyone explain the causeway which is only visible at very low tide just to the west of the power station towards the harbour wall? There seems to be a bouy at the end of it and the construction appears to be stone rather than brick. I too was an apprentice in 1970 and along with others, spent the first year in the training school. It was that winter that saw a work-to-rule and power cuts that affected the whole country. As an apprentice we were not stopped from going into the station to get to the school. Every Wednesday we would get the train to Worthing Tech, it was a long day – 09.00 till 19.30. The House Warden was a fantastic man along with his wife and two girls – Ken Sinclair. Christmas saw Ken invite all of us into his flat for a drink before we made our way home for a few days leave. Friday at the end of the working day would mean, if you were not staying at Southcroft, you would run with your travel bag to try to be in the first group to get a seat in the small ferry. 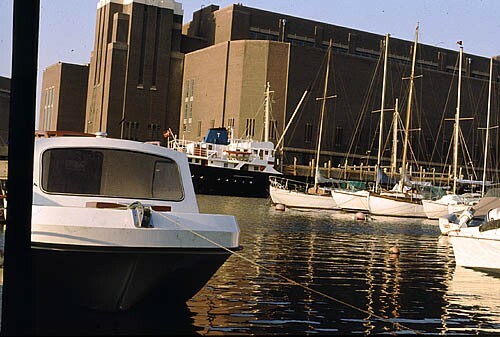 This small boat would take you across the harbour to the steps to the road and then onto Fishergate train station and home. Every other week we would be given a return ticket. Most of us would go home each week, this meant paying or.. I think from our weekly pay, we would have £1.25 taken to cover our food and room. As I remember, my take- home pay was less then £10 a week. Southcroft had a tv room, a games’ room and grounds. The local lads did not take to us at all and it could be a bit of a problem walking about. At the end of our first year, we had to clean the training school so it was spotless. Our trade tests were set out and we welcomed our family to the school to view our work, after we made our way back to Southcroft for a high tea. Good times! Peter, I’ve just been speaking to somone who went to Cockforsters training centre in the 80s. As an apprentince in the mid 70s, I also went to Brighton training centre and stayed at Southwick. Your memory of the time there is exactly the same as mine. A few years ago, I was passing Southwick and stopped to have a look at the place. It is now an old people’s home. Looks much the same from the front but now has a blue plaque by the door, Max Miller lived here. It’s a good few years ago now Mick that you and I spent time down in Southwick. I was asked to stay on for a couple of months and was put up in digs in Hove. I would make my way to the school each day and assisted the training engineers with some mods to the school, for my efforts I could choose a trade test that I wanted to make. As I remember there was another lad, but for the life of me I can’t think of his name, well it was 40+years ago. During that first year, lots of us would sweet talk Ken into letting us pop down to Brighton mid week to go to a gig in the town. We never let him down and always made it back in good order and even got a mug of cocoa from Ken’s wife before lights out! I worked at Brighton B station in the coal gang as a trimmer in the 60s. We had to go into the ship’s hold to trim the coal that was stuck to the sides of the hold, into piles so that the crane grab could get to it. We had to be alert to when the grab was coming and keep out of the way. I think we were paid ten shillings bonus per ship and if you were out of favour with the foreman you didn’t get a ship. I was doing that job about the same time as you Tony, when I was a labourer at the gas works. We didn’t get any extra as I remember. It was quite scary when that blooming great grab came down wasn’t it? Luckily I didn’t have to do it very often! Surprising how we all still comment and are interested after all these years. I went to to cegb training school in 1967 and lived with 42 guys at Ashcroft in Kingston Lane. When Brighton B power station was being built, I’m sure I remember a newspaper article about an accident when a worker fell from the top of a chimney. My dad had a small (17″ at the waterline) sailing cruiser based in Rye in the later 1970s, and one day we put in to Shoreham. I was in awe of the huge magnificence of Brighton B, and this was long before I had developed my later crush on the entire Gilbert Scott family! Apart from everything else, it took us ages merely to travel past it, it was so long. I am so glad that I got a chance to spend a night sleeping on the boat under the shadow of its eastern chimney, and I am truly shocked to find that it’s gone. Who was the architect? I was wondering if anyone could help me with a query about Brighton A. I have been told the the chimneys were demolished in 1973-74 but the info I have seen online suggests a little later….after 1977. Was any demolition work done earlier? Did anyone work for the McGee Group at the power station? I was in the hostel in 1967, came from Croydon, used to get a free pass home every two weeks. I seem to remember that rooms had to take turns in washing up and tidying the kitchen. Went to Worthing Tech and never had enough money for the train fare come Wednesday, that platform ticket took me miles. Walking past the big containers of Bristol Harvey Cream sherry on the dockside by the lock gates. And going to the youth club at the top of the hill with a quarter bottle of Scotch. Wonderful times. An instructor I remember was Mr Rose and another fella who had a hook for a hand. Ahh 1967. I think you are talking of Mr More? He was the instructor for ICA. Mr Young was for Electrical and Mr Nicalson was the Manager. I don’t remember doing much washing up but I do remember us playing football on mass on the green. Hey lads the bench fitting instructor in 1970 was Mr Payton, I can remember the first test was the one inch brass cube and plate, a right disaster, but then the final bench test was the dovetail slide, which was pretty close tolerance. Hi Tony, hope you are well mate. Have you still got the Blue Morris, worth a few bob now. Was a good year at Brighton and we were lucky to have had such a good grounding. When I was 12 the James Rowan was my ship. I used to get the papers for the crew. I have so many memories of those days. I still think of the crew before I went to sea. Hi Tony and Pete Bernardi, I went to Bankside as you no doubt remember. Great days as apprentices, Seltec also. Oh the Morris 1000. Many a scary drive. Pete’s green MGB Roadster was a nice car. Wonder where everyone is now? Well Kev, nice of you to remember my MGB – loved that car. Had it for a few years, then when I was buying our first house sold it to pay for a bathroom, loo etc. Little story, Terry Whatley and I were coming home from a night club and I lost it around a bend, back wheel hit the curb and bent the back axel…snapped the halfshaft a couple of days later, lucky to get a back axel from a scrapyard and new half shaft pressed in. As you say..happy days. I’ve now retired and so has Terry. Bit like you, I also wonder what our old mates are doing now. I’ve got a couple as FB friends and we talked about trying to hook up for a beer at some time, you can find me on FB; would be good to chat. Help. I worked on the site back in 57/8 mixing the asbestos for the laggers. Can anyone remember the name of the company that had the contract as I have developed asbestosis and need the name. I can remember most of the old mates from then but not the company name; the beauty of old age. Barry. Have a look at Wikipedia. There is some information including about nationalisation. You might have to do some digging from there. Try Facebook for your old mates. Also Barry there is a Government Compensation Scheme for those who cannot trace their employer. Do a Google search for it. Hi, I was at the training school in 1970 and the wages was £5 16s 4d 2shillings a hour! I thought it was Ashcroft House, Max Miller’s old house. I happened on this thread by accident while looking at pictures of old Uskmouth power station (re Ellis Heffarnan Jan 2009) My father died in a loose scaffolding accident, but in Uskmouth PS, in June 1959. His name was Jim (Jem) Kehoe. I couldn’t help wondering whether your grandfather was remembering the same accident. Did he ever work at Uskmouth? I was an apprentice electrical fitter with SEEBOARD, the youngest at fifteen years old and I attended the CEGB apprentice training school located between Brighton ‘A’ and ‘B’ power stations for ten months, during winter 1962/63, the coldest winter for ages. I was one of the last SEEBOARD apprentices to attend this Brighton CEGB apprentice school. I do remember Mr. Nicholson, Thompson and instructors Brown, Shaw and Payton. I also remember volunteering to carry the tea break, tea urn from Brighton ‘A’ canteen back and forth to the school. Most days were spent, initially, bench working and then lathe, milling and shaping machine use. Finally arc welding and lastly electrical wiring practice. During most weeks Tuesday and Thursday afternoons were spent in the sea-facing classroom writing and taking notes. This all ended with some trade tests where, of all things, I got top marks. I can remember a chimney being demolished in 1975.